BMW RLL wins the 24 Hours of Daytona and dedicates victory to Charly Lamm – Alex Zanardi makes inspirational appearance in the BMW M8 GTE. Daytona FL January 27, 2019; BMW Team RLL took victory at the 24 Hours of Daytona (USA) . When the opening round of the IMSA WeatherTech SportsCar Championship was suspended due to heavy rain for the second time, the #25 BMW M8 GTE and drivers Connor De Phillippi (USA), Augusto Farfus (BRA), Philipp Eng (AUT) and Colton Herta (USA) were leading the GTLM class. The race did not resume, leaving the BMW drivers to celebrate victory. The appearance by Alessandro Zanardi (ITA) meant the team’s #24 car was the centre of much attention at the endurance classic in Florida. It proved to be a difficult race for the Italian and his fellow drivers John Edwards (USA), Jesse Krohn (FIN) and Chaz Mostert (AUS). The quartet eventually came home in ninth place. This latest success was the third GTLM victory in the IMSA series for the BMW M8 GTE. BMW celebrated its first win at Daytona back in 1976 with the BMW 3.0 CSL. This was followed in 1997 and 1998 by two class victories with the BMW M3 GTR. 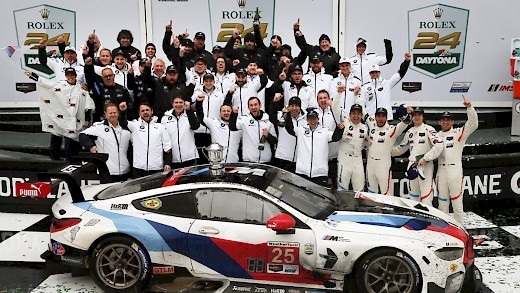 Overall victory went to Daytona prototypes with BMW Power in 2011 and 2013. BMW Team RLL finished on the top step of the podium at Daytona for the first time. De Phillippi, Farfus, Eng and IMSA debutant Herta enjoyed a largely trouble-free race. Herta set the fastest GTLM lap time of 1:42.908 minutes on lap 64. Heavy rain started to fall during the night, causing the track conditions to deteriorate from lap to lap. With seven hours remaining, race control decided to suspend the 24 Hours of Daytona for safety reasons for the first time. The race resumed under yellow flags roughly two hours later. In total, the 24 Hours was interrupted by yellow flags 17 times. When the cars were free to race again, the BMW drivers held their nerve, avoided making any mistakes and established themselves in the leading group. One lap before the race was suspended for the second time, Farfus, at the wheel of the #25 car, took the lead in the GTLM class. This ultimately proved to be the decisive moment in the race, as the race never resumed and the BMW drivers were left to celebrate a momentous victory. By the first race-suspension, Zanardi and his team-mates were already several laps behind the GTLM leaders, following a number of stops for repairs on the #24 car. 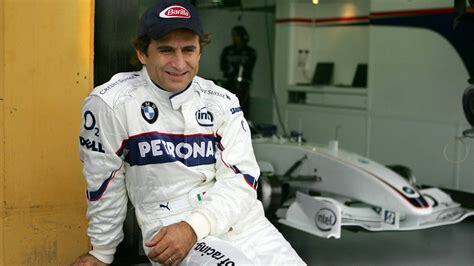 At the end of a pit-stop in the early stages of the race, the car was dropped off the air jacks at the very moment that Alex Zanardi, who lost both his legs in a crash in 2001, was pushing his specially adapted steering wheel into place on the column. As a result of the jolt, the column was damaged and Zanardi couldn't engage the steering wheel correctly. This coinciding of the two actions had never occurred in testing. The necessary repair work cost the #25 crew a lot of time. As the race continued, the BMW M8 GTE dropped further back, as a result of several smaller incidents. However, quitting was no option for Zanardi and his fellow drivers. Despite having little luck in the race, the appearance of the former ChampCar champion proved very popular at Daytona – with drivers, teams and fans alike. Turner Motorsport raced with the #96 BMW M6 GT3 in the GTD class. After 560 laps, the team and drivers Jens Klingmann (GER), Bill Auberlen (USA), Dillon Machavern (USA) and Robby Foley (USA) finished tenth. The race weekend was overshadowed by the news of the sudden death of long-term Schnitzer team principal Charly Lamm. In memory of Charly, BMW Team RLL competed with the words “Godspeed, Charly” on the rear of both BMW M8 GTEs at Daytona.